One of the most prolific hold'em players of this generation finally has his first gold bracelet. The United Kingdom's Chris Moorman is the 2017 World Series of Poker (WSOP) Event #27: $3,000 No-Limit Hold'em 6-Handed champion. Moorman, who has over $14 million in career online earnings, will add $498,682 to an impressive $4,628,200 in career live-recorded tournament earnings. Moorman defeated Brazilian Bernardo Dias heads-up after a battle between the two that lasted over three hours. Though Moorman has had a stellar WSOP career, the gold bracelet is really the only thing that had eluded him. Moorman previously had four final table appearances including two runner-up finishes in 2011. This marks his 30th career WSOP cash which now totals $2,433,640. When asked how this accomplishment compared to his online feats, Moorman responded with, "I feel like anytime you win live, it's just a lot more real. All your friends are there celebrating with you and particularly a lot of my online success was when I was living in the U.K. I would be playing all through the night and maybe win a tournament about five or six in the morning and I would just be there on my own." Moorman went on to say, "The series is still young, there are plenty of more events out there. I've already had three cashes, including this one, and I feel great and confident. Hopefully, I can make a final table and if not, hopefully, some more Brits do and I can be on the rail and support them and I would be just as happy, to be honest." Moorman came into play on Day 3 sitting fourth in chips behind fellow countryman Max Silver. Before the final table got underway, there was still business to be completed. There were 21 hopefuls return on and some big names fell before the action moved to the grand stage. Nacho Barbero (19th - $18,019), Samantha Cohen (17th - $23,029), Simeon Naydenov (16th - $23,029), James Chen (14th - $23,029), and Pratyush Buddiga (11th - $29,974) are just some of the players Moorman slid past en route to his win. Silver led for the majority of this event and was set to take the chip lead again getting his stack in the middle against Michael Gagliano. Silver had the best of it with pocket kings against pocket queens but a queen on the flop gave the pot to Gagliano and Silver was first to drop. After Moorman had doubled up and taken a huge lead, John Gorsuch tested his luck and though he got it in bad being dominated by the eventual champion, Gorsuch flopped two pair. The river, however, had other ideas and gave Moorman a better two pair and Gorsuch was eliminated. 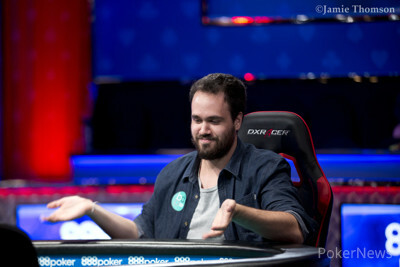 Moorman took out arguably his biggest threat in two-time bracelet winner Steve Sung. Sung had the chip lead for the early stages of Day 3 but got it in with ace-seven against Moorman’s pocket queens and though he hit an ace on the flop, there was a queen right behind it, sending him to the rail in fourth. A battle of the short stacks came to a conclusion when Dias put Gagliano at risk. Gagliano’s ace-eight was in rough shape against the Brazilian’s pocket eights and no help from the board set up the heads-up battle. Dias and Moorman played almost a hundred hands before the latter was able to finish the former off for good. Moorman kept hold of the chip lead the entire battle but could not keep the Brazilian down. Staving off elimination for the better part of four hours, on Hand #132, Moorman finally closed the curtain. Dias open-jammed with king-ten and Moorman snap-called with ace-king. 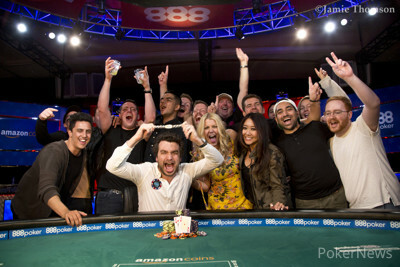 The board ran true and Chris Moorman was awarded his first WSOP gold bracelet. 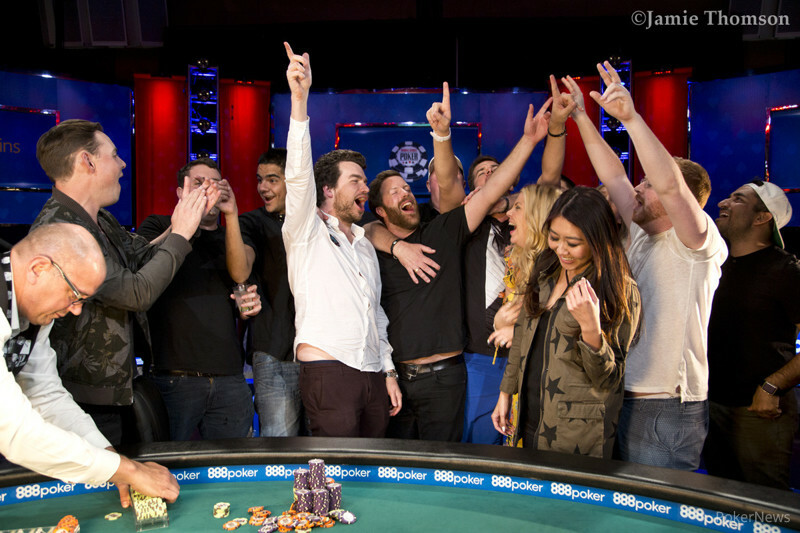 Britain's Chris Moorman captures his first WSOP Gold Bracelet in event 27. Hand #132: Bernardo Dias open-jammed all-in and Chris Moorman snap-called, putting the bracelet on the line. As the players rallied with their respective rails, the dealer patted the table and fanned out a board. Moorman’s ace-king high held and Dias was eliminated in second place for a score of $308,166. Hand #126: Chris Moorman raised to 320,000 on the button and Dias folded. Hand #127: Dias opened to 350,000 on the button and Moorman called. The flop was and Moorman checked. Dias bet 400,000 and Moorman raised. Dias snap-folded and Moorman took that pot. Hand #128: Moorman limped the button and Dias moved all in from the big blind. Moorman folded. Hand #129: Dias went all in on the button for 3,140,000 and Moorman asked for a count. He thought for awhile and asked Dias, "Should we gamble?" After a couple more minutes, he folded. Hand #130: Dias limped and Moorman went all in. Dias folded. Hand #131: Moorman raised to 320,000 on the button and Dias moved all in. Moorman folded and Dias took down the pot. Hand #120: Chris Moorman raised to 360,000 and Bernardo Dias moved all-in forcing Moorman to fold. Hand #121: Dias limped and Moorman checked, seeing a flop. Dias bet 200,000 and Moorman check-folded. Hand #122: Moorman opened to 360,000 and Dias three-bet to 1,150,000. Moorman folded. Hand #123: Dias gave Moorman a walk. Hand #124: Moorman opened to 320,000 and Dias called bringing a flop. Dias checked and Moorman continued with a bet of 245,000 getting a fold from Dias. Hand #125: Dias limped and Moorman three-bet to 480,000. Dias called and a flop was fanned. Moorman fired a bet of 400,000 and Dias folded. Hand #115: Bernardo Dias limped on the button and Chris Moorman checked his option. The flop came and they both checked. The turn was the and they checked again. On the river, Moorman bet 225,000 and after thinking for a little while, Dias folded. Hand #116: Moorman limped on the button and Dias moved all in. Moorman folded and Dias won the pot. Hand #117: Dias limped on the button and Moorman checked his option. The flop was and Moorman checked. Dias bet 175,000 and Moorman called. On the turn, Moorman checked, Dias bet 475,000, and Moorman called again. The river was the and Moorman checked once more. After about a minute, Dias moved all in. Moorman got a count and it was 1,525,000. Moorman thought for a few minutes and called. Dias had pocket nines for a set on the turn and Moorman's got flashed before it went to the muck. Dias doubled back up to around 4,500,000. Hand #118: Moorman raised to 360,000 on the button and Dias called in the big blind. The flop was and they both checked. On the turn, Dias checked, Moorman bet 300,000 and Dias folded. Hand #119: Dias limped on the button and Moorman checked in the big blind. The flop was and Moorman checked. Dias bet 200,000 and Moorman called. The turn was the and they both checked. On the river, Moorman bet 775,000 and Dias folded. Hand #110: Chris Moorman limped and Bernardo Dias checked his option. On the flop, Dias checked and Moorman bet 125,000, winning the pot. Hand #111: Moorman was given a walk. Hand #112: Moorman opened to 260,000 and Dias defended, seeing a flop. Dias check-folded to a bet from Moorman. Hand #113: Dias opened to 250,000 and Moorman three-bet to 625,000. Dias folded. Hand #114: Moorman opened to 260,000 and Dias folded. Hand #105: Bernardo Dias limped on the button and Chris Moorman checked his option. The flop came and Moorman check-called a bet of 125,000 from Dias. On the turn, Moorman checked again and Dias bet 350,000. Moorman flicked his cards to the muck and Dias took down the pot. Hand #106: Moorman raised to 260,000 on the button and Dias called. The flop was and Dias checked. Moorman bet 225,000 and Dias called. On the turn, Dias checked again and Moorman bet 650,000. After a long pause, Dias called and the river was the . Dias checked once more and Moorman put together a hefty bet of 1,400,000. Dias thought it over for a couple minutes and folded. Hand #107: Dias folded on the button and Moorman won the blinds and antes. Hand #108: Moorman raised to 260,000 on the button and Dias let it go. Hand #109: Moorman got a walk.